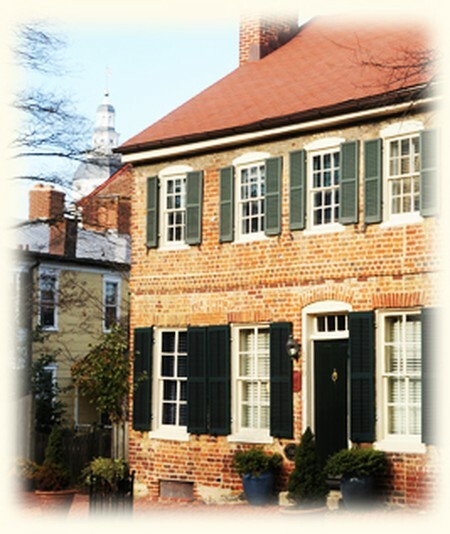 The two-story, five-bay brick house at 170 Duke of Gloucester Street is one of the oldest structures in Annapolis, and it is the second oldest home in this historic city being used as a bed & breakfast. First built in 1747 as a two-story, one-bay, one room house, it was expanded in 1760 to a five-bay brick house with center entrance. Included in the addition was a stone-walled cellar incorporating a still existing cooking fireplace. Charles Willson Peale's Portrait of William Paca The house has served many uses during its history, including an occasional meeting place for two elite men’s groups of the late 1700s. The Tuesday Club was formed in 1745, and over the next eleven years almost everyone of some importance in the northern Chesapeake Bay area either joined or attended a meeting. Its members included Thomas Bacon, one of Maryland’s most prolific authors, and Jonas Green, publisher of the Maryland Gazette. Visitors included Benjamin Franklin. The Forensic Club was organized in 1759. Meeting every Monday fortnight, its members were chiefly young lawyers and tradesmen in the city, with a sprinkling of persons of higher social status. Among them were William Paca (pictured left), Samuel Chase, and Thomas Stone, all of whom signed the Declaration of Independence, and Charles Willson Peale, painter and founder of America’s first art museum in Philadelphia (a copy of his 1772 portrait of George Washington hangs in the front parlor). Each evening a debate was held on some political or ethical question, such as whether aristocracy was a better form of government than democracy, and, as early as 1765, whether it was justifiable to take up arms to deliver subjects from the yoke of a strange prince who had become a tyrant, and even whether it was right to dethrone a king. The Daniel Dulaney family, owners of the house from 1761 to just after the Revolutionary War, also contributed to its early history. Margaret, Daniel’s daughter from his second marriage, married Dr. Alexander Hamilton who was the founder of the Tuesday Club. Mary ("Mollie") Chew Dulaney, daughter of Daniel’s third wife, married William Paca. And when her brother died in 1770, she and her sister Margaret inherited Wye Island, where Paca built the elegant Palladian style Wye Hall. Lloyd, Daniel’s son by his third wife, inherited the Duke of Gloucester house and a larger main house on Church Street when his mother died in 1765. But all of the Dulaney properties were seized after the War because they were thought to be British Loyalists. Lloyd later died in a duel with the former Pastor of Annapolis’ St. Anne’s Church, in Hyde Park, London. Sometime in the late 1800s the brick house was connected to a later residence, and the house was divided to create a separate rental unit. From here the history of the house is hazy, but we know that the two sections were eventually recombined and the second entrance retained. Other rooms were added at the rear, but the five-bay brick house retains much of its original flooring, 16-inch thick exterior walls, and a total of six fireplaces. The house was first converted into a bed & breakfast in 1994.